Ok, everyone sing along with me. You know the song. (Don’t It Make My Brown Eyes Blue) I just made up the words. It was so dreary, wet and cold yesterday. I had errands to run in the morning. How is it I Always pick the rainy day to run errands?! There must be something wrong with me. It made me rather cranky too. I tried to keep that to myself but the crankiness almost got me into snacking trouble in the evening. After getting home and putting things away, I realized I hadn’t eaten breakfast. I’ve been doing that too often lately and have to get back on track with breakfast In The Morning where it’s supposed to be. It was so dreary that I had to resort to the flash at 11am!! 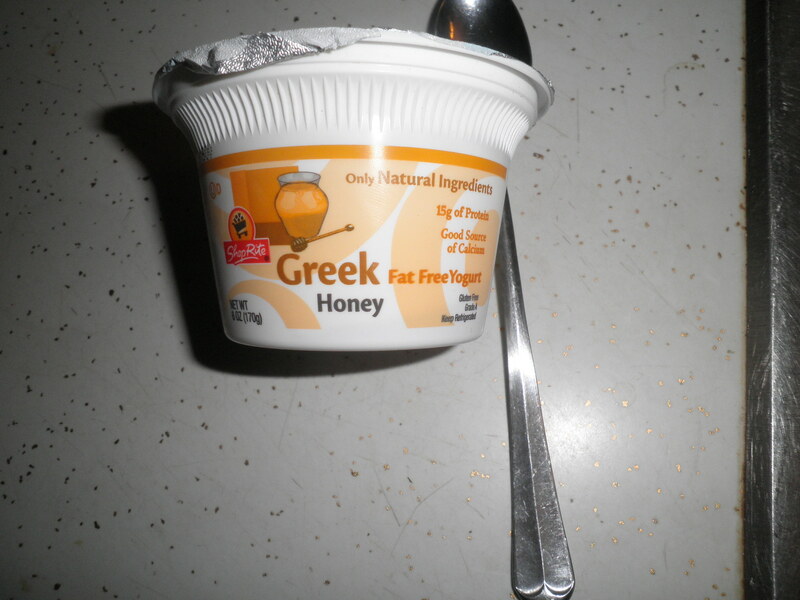 This was my first time trying the Shoprite store brand of Greek yogurt. This was delicious! Since it’s less expensive than Chobani (I’m sorry Chobani, I still love you!) I will be going back to try other flavors. 3 Points on Weight Watchers and 15 grams of protein! Can’t beat that. I forget what it cost, but I know it was less expensive than the Chobani. Lunch looked like a repeat of the previous day. By the time I got to dinner, I was not enthused about anything. I was hungry, but didn’t feel like chopping or preparing anything. I went the quick and easy route. Morningstar Farms Tomato & Basil Pizza burger on a Nature’s Own sandwich thin. The burgers are great and I like the sandwich thins because they’re only 2 points on WW. I can only find them at Walmart. Most of the other sandwich thins I’ve seen are 3 Points. These are good. I actually ate 2 of these, but I thought the photo looked better with only one. 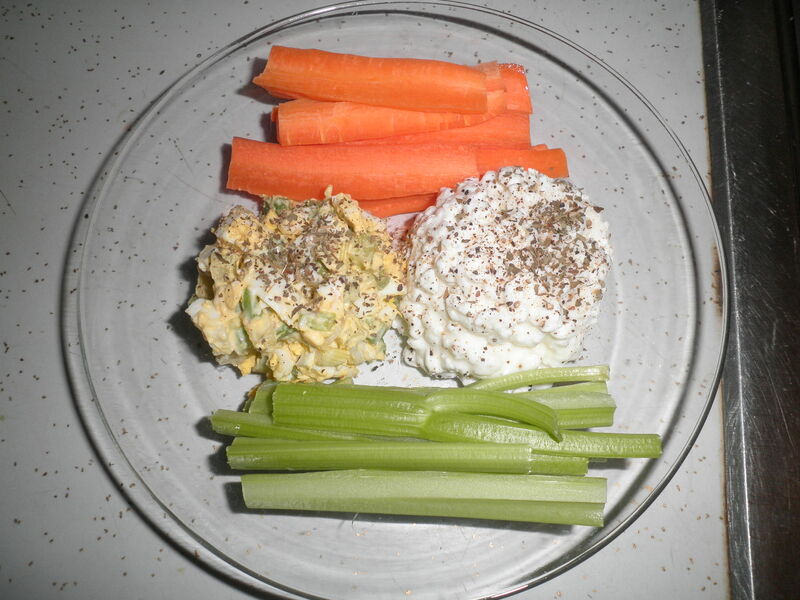 I had 2 clementines and popcorn for a snack later, but then as I mentioned earlier, I finished off the egg salad too. Don’t know why it was such a tough evening, but at least I had a snack with some more protein. Actually this was quite a protein packed day for me, so over all I was pleased. Almost finished Mockingjay. I expect to finish it today. Hi Ameena! 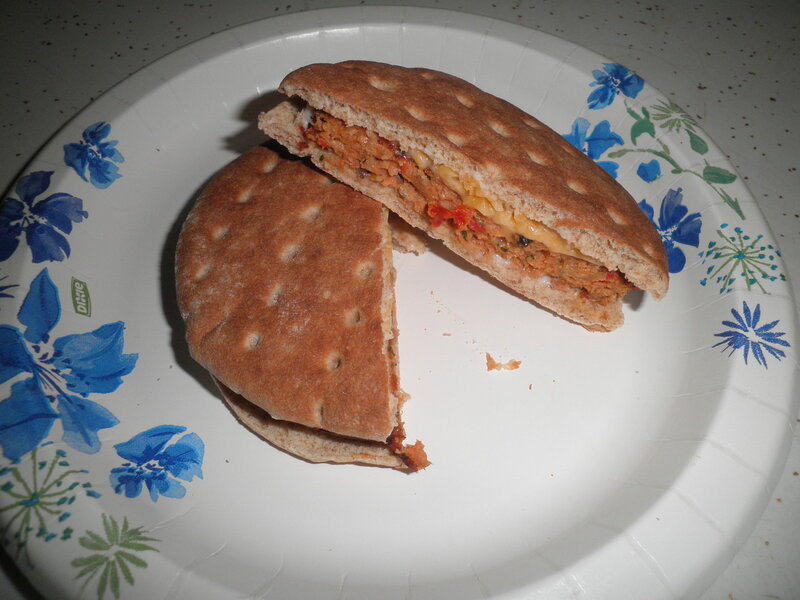 Yes I have tried the masala veggie burgers. They were very tasty. But as I always whine…I don’t have a local TJ’s. I really need to make a pilgrimage. Maybe in a few weeks. Hope you enjoy finishing your book 🙂 I hate day’s when its dark all day like that, hopefully we should be seeing the last of those for a while now its March! All finished with Mockingjay! I did enjoy it! Still dreary here so I’m going back into a book! That song was my favourite when I was little because my Dad had the record and played it a lot – that’s just made me nostalgic! It’s been lovely in the UK today, so I’m enjoying it as much as I can before it turns dreary again. I always like that song too, Sarah! Don’t know why it came to mind this morning, but it did. Enjoy your beautiful day! i know what those nights are like! i forsee my dinner tonight looking simple like your was on this day. Hi Sara. Had another night like that last night. Nice to know I’m not alone! Have you finished Mockingjay? What did you think; I didn’t expect half of what happened in that one but enjoyed them all so much… might have to re-read them! Hi Eleanor! I really did enjoy Mockingjay. I heard some people say it wasn’t as good as the other two. I think it was a tough job to wrap all of that up, but I think she did an admirable job. I think you’re right about a re-read! Are you on Goodreads? ?